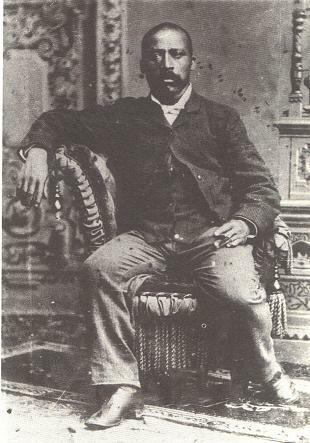 Tom Snowden born about 1802, was the slave of William Penington Burgess, from Frederick County, Maryland. Prior to that, he was owned by William P. Burgess Sr. At some point in time we have to assume that Tom was probably owned by the Snowdens of Maryland to have acquired the name Snowden. Around 1825, Tom, William Pennington Burgess, Lydia and her parents Jesse and Ruth Plummer trekked to Mount Vernon, Knox County Ohio, from Frederick County, Maryland. Ellen Cooper was born in 1817 near Port Tobacco, Charles County Maryland on the plantation of Alexander Greer. She was the daughter of Henry Cooper, slave of Alexander Greer. In 1827, Alexander Greer sent 10 year old Ellen Cooper to accompany Mary Greer to Knox County, Ohio. Her trip started by boat, a trip that her ancestors made when brought from across the waters many rains ago. Ellen, forever separated from the family she left behind, was permanently exiled in freedom. Her father and brother, Henry Cooper Sr. and Henry Cooper Jr. were promised their freedom, but laws in 1839 had been enacted forbidding manumission, as a result of the Southampton revolt. In 1829, it was recorded that Tom Snowden purchased a 150 acre parcel of land from the Plummer family. The plat reads P. Plummer 150 a sold to T. Snowden colored man On October 9 1834, Thomas Snowden age thirty two and Ellen Cooper age seventeen were married. Their marriage was the first among blacks to be recorded in Knox County. With Tom's parcel of land, he and Ellen raised a family and farmed, settling in the village of Clinton, just north of Mount Vernon. Ellen was a member of the A.M.E. Church in Dansville, during the time she was with the Greer's. Later, the family became members of the Wayman Chapel A.M.E. Church, this became their home Church. Ellen and Tom were the parents of 9 children. Oliver B. born in 1835, died at the age of eleven in 1846. The inscription on his headstone reads: Son of Thomas and Ellen B. Snowden, died Oct 21, 1846, aged 11 years 29 days. Happy soul thy days are ended, All thy moaning days below, Go by angels saints attend me, To the sight of Jesus go. Mary headstone reads: Mary G. daughter of Thomas and Ellen B. Snowden. Died June 3, 1844 aged 2 years 4 months and 21 days, Me think I see her joyful stand before the God of Heavon, She smiles as she reaches Zion, And her reward is given. 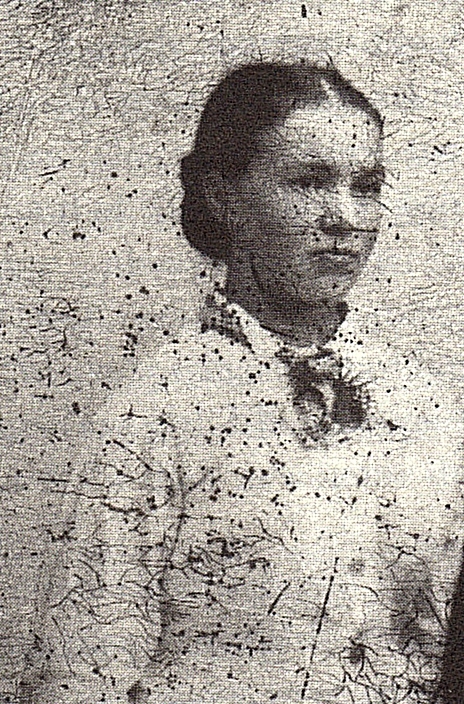 Martha born 1847, according to the deaths in Knox County, there is a record for a Martha Ann Snowden, (this may be Martha, however the record list race as white?) she died May 23 1870 age 19 years 7 days of Liver disease. Sophia M. was born about 1837. As she lost her brothers and sisters, one by one, she remembered them in her writings and in her poetry. The inscriptions on their headstones were written by Sophia. Her deep felt sorrow can be read through the lines of her writings, which many of them can be viewed in the Snowden Collection. Sophia died at the age of 41 years old, single and childless, July 17, 1878. Ben according to his death certificate was born December 9, 1844 and died at the age of 73 years 4 months and 17 days, April 26, 1918. He too died single and childless. Ben was buried at the Morris Chapel in Mt. Vernon. Lewis (Lew) was born 1848. He loved his music and he loved to sing. He also enjoyed horse racing at the County Fairs in Ohio. Lew died at the age of 75 years old, on January 4, 1923. He too died single and childless. Lewis was the last one on that branch of the family that came to Ohio so many years ago. His death certificate states that he was buried at the Lorey Chapel Cemetery in Mount Vernon. Phoebe was born 1845. Annie was born in 1855. Annie was billed as the infant violinist and she had a great passion for the fiddle and guitar. To the right, is a post mortem photograph ca. 1865. This, to me, appears to be Annie caressing the guitar, with her fingers positioned as though she were actually plucking a tune. This does not appear to be a child of ten as the date of the picture would indicate. Supposedly, Annie died May 1870 at the age of 25. That would mean she was either born in 1850 or she was 15 years old instead of 25 or the date of death was wrong. The date of death listed, May 23 1870, was the date of death listed for Martha A.. Elsie D. (Elcy) was born in 1854 and died in Morris Township April 4, 1872 of congestion. The Snowden Family Are Coming" The Snowden's were well known for their musical talents. When they were young, they used to entertain the locals and visitors to the area with their songs. They were also known to have been the composer's of DIXIE. For many years a great deal of controversy has surrounded this subject. And it will for many years to come. D. D. Emmett received the glory, but the Snowden's know the story. Our family history will speak for itself. Ben and Lew Snowden have claimed Dixie all their lives, with no recognition for it. They were finally given the recognition they should have received in life. 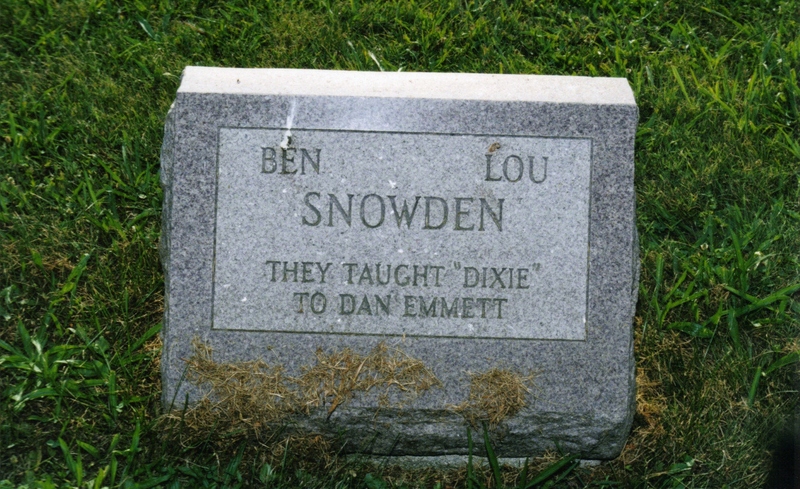 Ben and Lew's grave marker stands as testiment to their story of Dixie. Their headstone was placed there by the Black American Legion Post, in the year of the American Bicentennial. In the History of Knox County by Frederick Lorey, he says this: Ben and Lou won fame and a certain amount of fortune a hundred years ago with their open air loft; theater, on Clinton Road and traveling musical act. The Snowdens were a musically talented family.....and the Snowden home was known as a lively and melodious place. Sons, Ben and Lou (Lew) were the most talented. 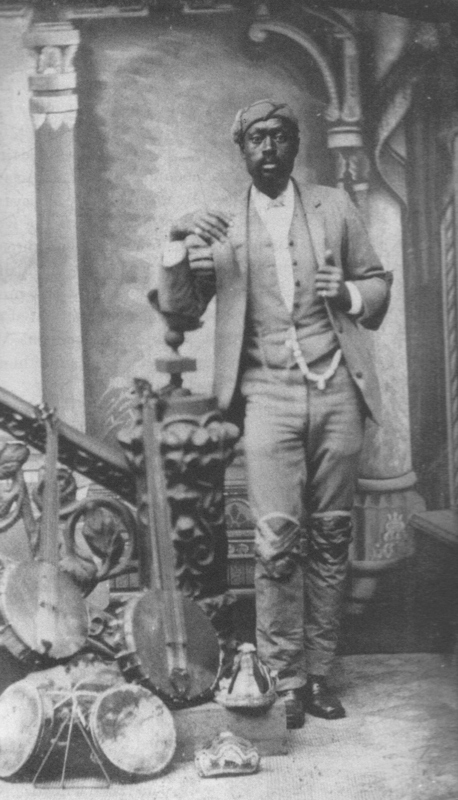 Through the middle and late years of the 19th century they became widely known as musicians and entertainers. Ben and Lou (Lew) built an open air theater in a gable end of the east side of their home, where they gave frequent concerts. As their fame spread they began performing in schoolhouses and towns around the area, traveling in a carriage and often playing and singing as they traveled. The presence of the Snowdens in Mount Vernon, seemed to have magnified the town, however, there is very little mentioned of their presence and more than enough mention of D. D. Emmett. Both names should be simultaneously spoken of together, to give each their just reward. The town is still named Mt. Vernon, they havent changed the name of the town to Emmettown yet! 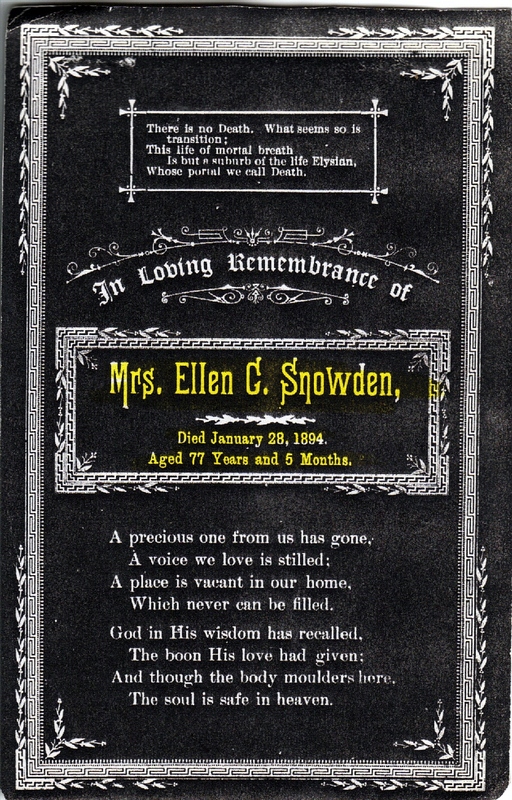 Tom Snowden died July 25, 1856 and Ellen (Cooper) Snowden died January 1894, in Mount Vernon at the age of 77 years. Ellen remarked to a friend a week before she passed to the great beyond : "I am the last of that little colony that came out here from Maryland so many years ago."